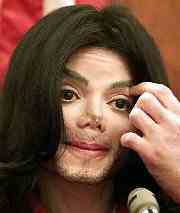 Surely no artist held a candle to the wonderful weird wild Wacko Jacko. I dare Marilyn Manson or GWAR or Karen Finley or Mariah Carey to try to top this wonderful conceptual art guru who has emerged from the depths of a bathtub filled with naked 14-year old television boystars to become the Performance Artist of the Century! kids from the balcony” tour! And those of us in the know figured that his ploy of dressing his kids in burkas for their visits to the zoo was probably an attempt to sell some records in Afghanistan – well, he’s got try to be no. 1 somewhere! And finally there was the piece de resistance, or should I say, the Sir Nose D’Voidoffunk! A nose with 3 holes! Noses popping off in first class! And noses peeling and falling off in court! And is that some kind of airfoil on his hose in the photo that accompanies this PoOp scoop? Now, there are some who claim that Jacko is trying to become Diana Ross or Brooke Shields, but one look at this photo and you can see that he’s trying to become the Scarecrow from The Wiz! The Wiz was his only Hollywood leading role, and he’s dying to be in a remake! Look! He’s perfect for	the part! guitar from Sly Stone’s Thankyou Fallettinmebemyself hit. When I first heard the cut on the radio, I thought it was a lady vocalist, but the DJ announced that it was by Jacko. And who could more truthfully say Thankyou Fallettinmebemyself again! to Mick Jagger, for teaching us “How to Be	Mick Jagger” – alright kiddies – Strut Strut Turn Strut Rooster Rooster Turn Rooster Strut Strut Turn Mince Mince Turn Strut Strut Schoolmarm Schoolmarm Turn Schoolmarm Strut Extra wag of finger Strut and Freeze! Ol’ Mick probably realizes that there’s a lot of moola to be made with exercise videos for the rapidly aging baby boomers! And to Brian Eno for coming out as an anti-war activist this year. Herc at the East River this summer! At one point U.Roy, Coxone Dodd and Kool Herc were on stage at once – essentially the men who invented the music of the last 10 years. IABAS are still kicking booty, whether at the Mid Hudson	Children’s Museum or at Rosendale Café. Percussion sounds from another hemisphere were the wonderful Gamelan Surya Kanchana at the Holy Cross Church in Kingston. Ari Up, Peter Stampfel and an amazing acoustic set from Baaba Maal at a Village Voice benefit for their 911 benefit album. How about that Ari Up & Nina Hagen gig this summer! Don’t we know a lot of people! Peter Stampfel, not well known as a protest singer, came up with “President Bush / Can kiss my Tush / Deep in the Heart of Texas” at a CBGB’s gig this summer. And props to Angel Dean & Sue Gardner who brought back fond memories of Shackwacky at the same gig. (Yo! to Yo La Tengo!) The Raymond Scott Orchestrette are a real gas – I caught them at the Colaburgh Lodge in Croton this spring. Other props to Calvin Johnson, Joshua Rifkin, the Battlefield Band, Lindisfarne, Gary Lucas, Michael Hurley and Little Annie for wonderful evenings! And let me not forget Vivian Goldman’s great lecture on the history and mystery of reggae. (She was dancing at the U.Roy gig too) Not	forgetting John Cale’s set at the Harvestworks benefit/ tribute to Robert Moog, with Judy Nylon as MC! As usual, Vassar’s WVKR, 91.3, is still the best in the	valley, and shout-outs must go to Geet Mala with Padma, to the Polka shows with Mike and Terry and with John Sagan, and to my favorite, reggaespectrum.com with Dexy B and Supa T for the best in reggae and rocksteady! Other props to the Fancy Broccoli show and Diggin’ in the Crates – where Funk liveth itinually. 24-HOUR PARTY PEOPLE: A hoot! Martin Zero – Too Big for Death! Ginger Geezer – the Life of Vivian Stanshall by Lucian Randall & Chris Welch – funny enough at the start, but as Stanshall descends into sunken boats & sunken ambitions, it gets really depressing. Harry Smith’s Mahogonny – 3 hours of artistically framed film of mid-60’s Manhattan traffic is not art, it’s boredom. Be the first to comment on "Jim Finnigan Poop 02"